Because of the lack of trained geothermal professionals in the Louisville area we started our company in 2005, in order to offer home owners an eco-friendly, reliable and efficient way to heat and cool their home with significant yearly financial savings. With over 50 years of experience in the conventional heating and cooling industry, we also have over 28 years of expertise and knowledge in geothermal system design, installation, operation and maintenance. Our extensive experience allows us to offer exceptional customer service, support and product knowledge when designing and installing your geothermal system. In 1982 Larry Kaelin started his professional career in HVAC and worked in the field of service and install for 12 years. In 1994 Larry started working in Geothermal Systems sales and installation, and in 2005 started Geothermal by Design, LLC. 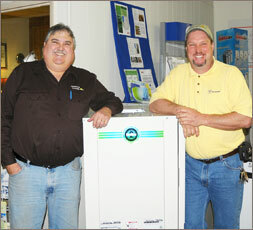 Since 2005, Larry has sold, designed and overseen the installation of over 500 Geothermal Units. During his career, he has attended over 20 Geothermal classes and taught several as well. In addition to Geothermal certifications, Larry holds certifications in gas and heat pump service and installation. In 1986 after completing his vocational training, Martin Madden began his career in the HVAC industry with Bill Clark and Sons. Within the 3 years, Martin became the company’s lead installer and spent the next 11 years as Installer and Service Technician servicing all brands, makes and models of both commercial and residential equipment. After becoming a complete expert in the industry, in 2001 Martin took on the new challenge of Geothermal Heating and Cooling. He spent 5 years learning the ins and outs of Geothermal Systems and in 2005 joined Larry Kaelin in starting Geothermal by Design, LLC. With over 26 years of experience in the industry, Martin holds certifications in Heat Fusion, Loop Design, Waterfurnace Geothermal, Comfort Aire Geothermal, Heap Pumps, High Efficiency Furnaces and Load Calculations. Every year, Martin installs and designs 30-40 geothermal systems, priding himself in his extensive knowledge of the product and his dedication to perfection and customer service. In order to ensure our continual product knowledge and expertise in Geothermal Heating and Cooling System Design and Installation, all of our employees are factory trained and certified. In addition, we continue yearly re-certification and continual education classes to guarantee constant product knowledge. Please contact us at 502.216.8300 or via email, with any questions or to acquire more information about Geothermal System Installation, Operations, Financial Savings and Maintenance.